I only bake for close friends and family!! 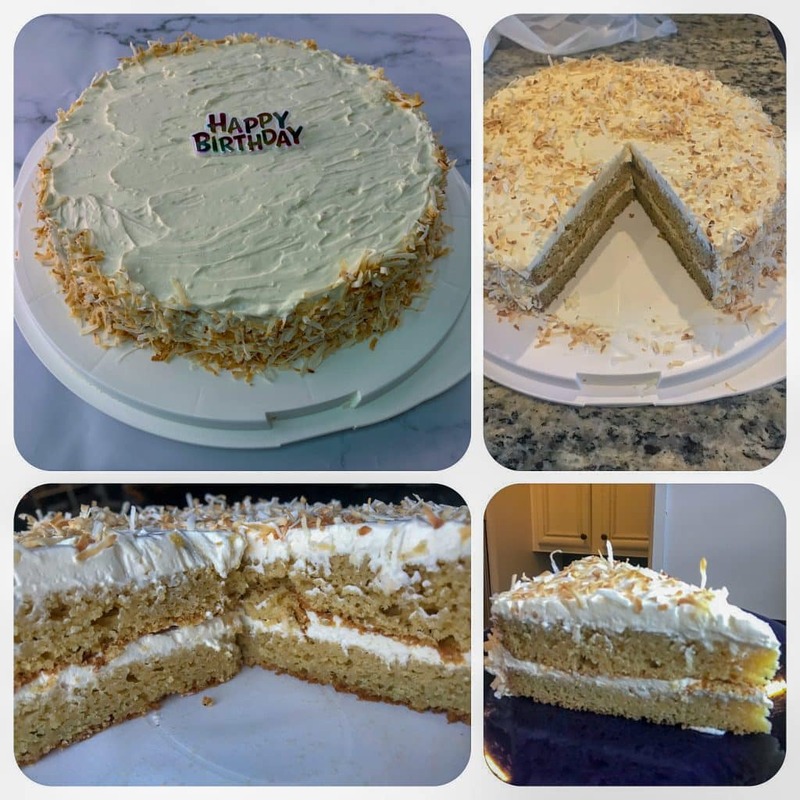 The other day I got a call from my good friends wife asking if I could make a coconut cake for his birthday. Normally the thought of baking brings a combination of panic and disdain but these are good friends and I need to branch out my recipe catalog so I agreed. I have a fantastic recipe for a zucchini olive oil cake that I figured I would use as a guide for this recipe. I left out the zucchini and substituted butter instead of olive oil. Needless to say that it turned out fantastic, hence my sharing the recipe with you. The cake was a big hit with my friends family and I was very happy when I got the word that the cake was well received. This was also the the first time I’d made a layer cake with frosting all around. I’m no expert but a few YouTube videos later I felt confident enough to give it a go. 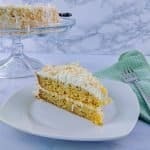 By no means was this the most beautiful cake in the world but it was tasty, Keto friendly and coconut so it met all of my criteria for this recipe. Check out this video on frosting a layer cake like a boss! 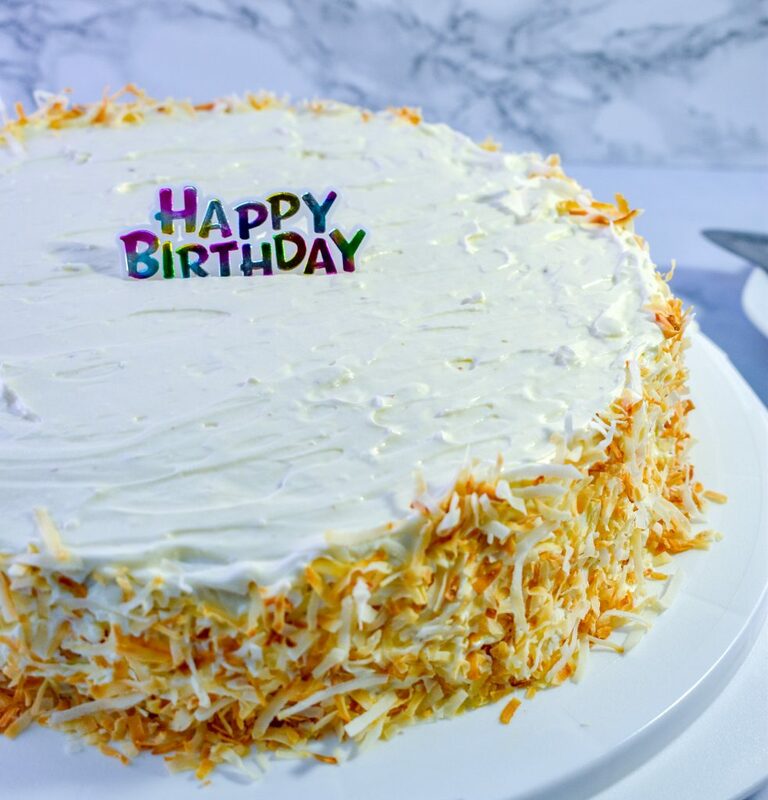 Coconut Cake that anyone Can Bake! 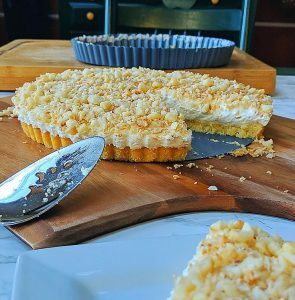 I used unsweetened coconut flakes to garnish around the sides which covered up a few spot I didn’t frost evenly. When roasting coconut be sure not to take your eyes off of it, you’ll go from beautiful golden flakes to bitter burnt trash in a matter of seconds. The good news is it only takes 2-3 minutes to toast the coconut. Simply add the coconut to a pan over medium heat. As soon as you smell the coconut beginning to toast start tossing or stirring and don’t stop until it’s reached your desired color. Have a separate container ready as you won’t want to leave the coconut in the hot pan even if you’ve turned off the heat. All of these tips I’m mentioning were learned the hard way so please heed my advice when toasting coconut. The frosting was a bit lighter than a traditional cream cheese frosting but held up well in my truck on a 75 degree day as I dropped off the cake. The sour cream adds a subtle tanginess to the frosting as well as creating a rich smooth texture. You can also substitute Greek Yogurt in this recipe if you so choose to achieve similar flavor and texture. Take the Cake On the Road!! 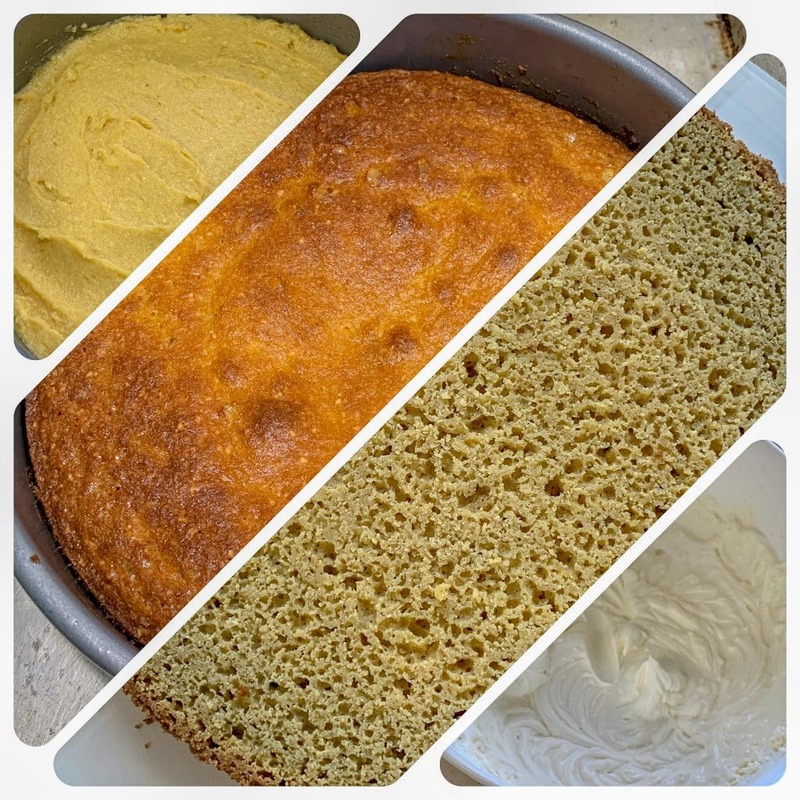 I dusted off a cake carrier for this recipe since I needed to take it on the road and it doubled as a cake spinner which was helpful when cutting the cake in half as well as during the frosting process. Normally I would have served a cake like this on a glass cake stand with a lid but they just don’t travel well. 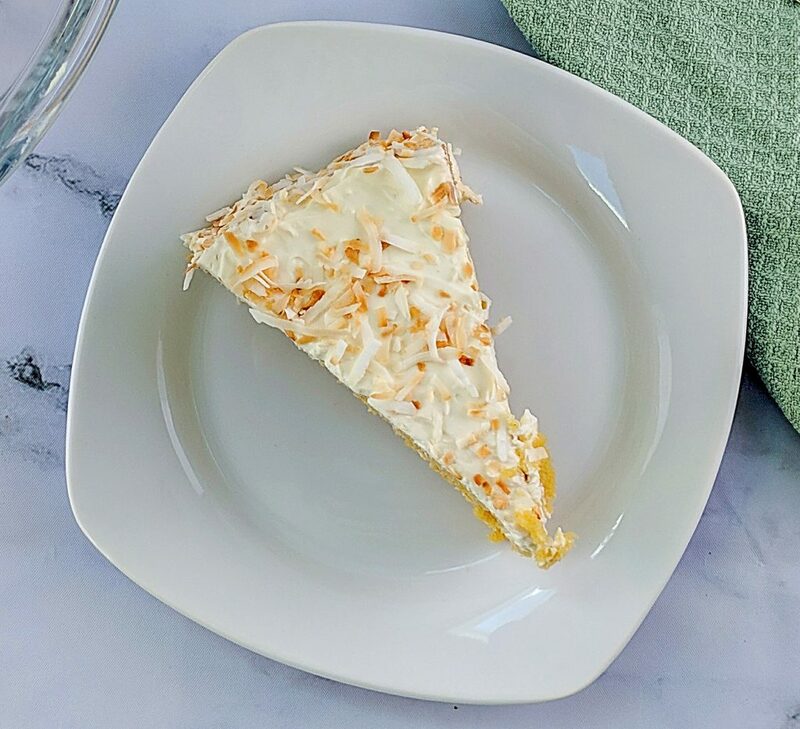 I’m glad that I had both options on hand and making this coconut cake has definitely inspired me to make more Keto baked goods in the future so stay tuned. When I was going through my list of ingredients I remembered that I had just run out of my Anthony’s Organic Erythritol but luckily my brother just so happened to be at the grocery store and was kind enough to grab some Lakanto Monkfruit Sweetener. It was my first time using this product but it did a fine job and I would say that either sweetener would be fine for this recipe. I wouldn’t recommend using straight powdered stevia because it tends to have a very bitter aftertaste. I find that the Sweetleaf vanilla creme sweetener is much better for baking as well as frostings. You can play around with the ratios to find the balance of sweetness that works for you. I tend to lean on the less sweet side of things because I feel like it distracts from the other flavors of the cake. 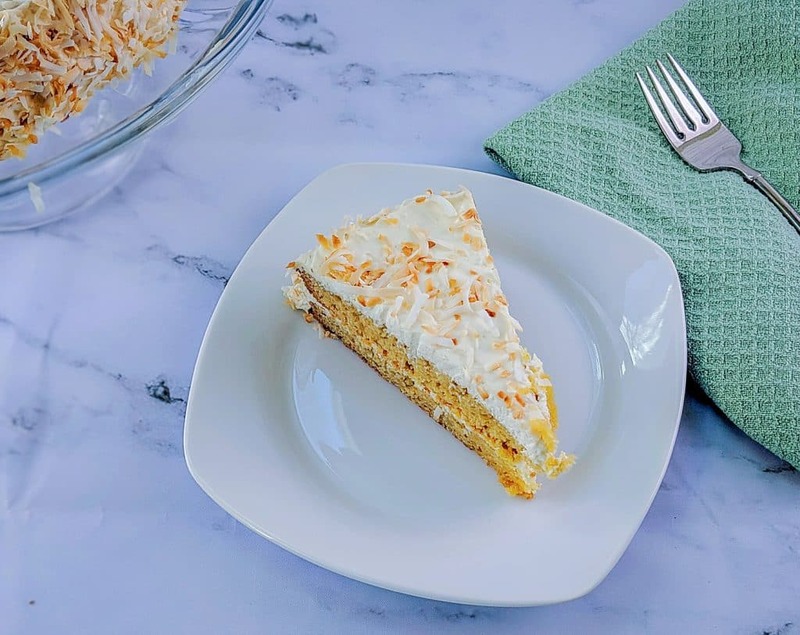 The last secret to this Keto coconut cake was using a flavored liquid concentrate from OOOFlavors. I used the cake batter flavor but they literally have hundreds of different favors from savory to sweet. 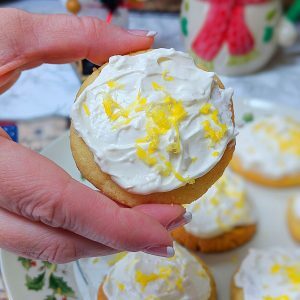 You don’t have to use these but it does add that Birthday cake flavor that is sometimes missing from gluten free Keto cakes. All in all I’m very happy with what I created and I look forward to making more Keto friendly desserts like this so if you have anything you’d like to see please leave a comment below. 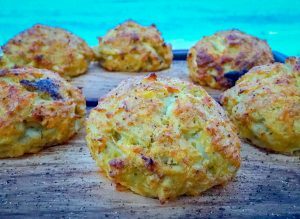 In addition please consider signing up for my email list so you’ll be notified every time I post a new recipe. As always thank you for the support and Keto on my friends. Pour cake batter into a sprayed 10” springform pan lined with parchment paper. Toast unsweetened coconut flakes in a pan over medium heat for 2-3 minutes until golden and evenly toasted. Stir constantly. To prepare frosting whip heavy cream with extracts and sweeteners to stiff peaks. In separate container combine sour cream and cream cheese until any lumps are gone. then fold the whipped cream into the cream cheese mixture. Finally pat the toasted coconut around the sides of the cake. 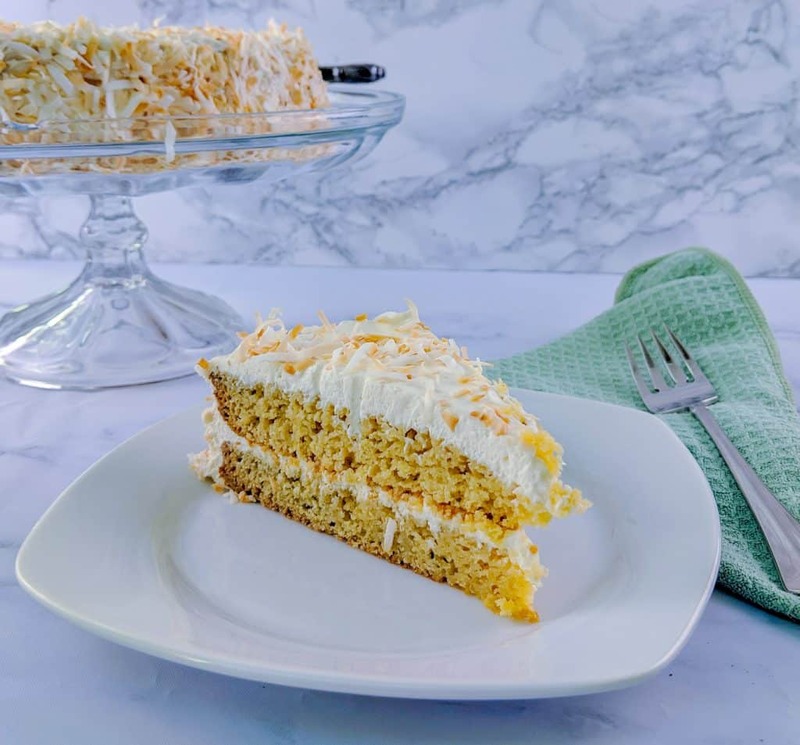 You may want to garnish the top of the cake with any leftover coconut.